Chinese authorities have ordered a mass cull of birds at a poultry market in Shanghai after the death toll from a new strain of bird flu rose to six. All the 14 reported infections from the H7N9 bird flu strain have been in eastern China and at least four of the dead are in the financial hub of Shanghai. The latest death was of a 64-year-old man in Zhejiang province, according to Chinese state news agency Xinhua. The report added that none of the 55 people who had close contact with him had shown symptoms of infection. 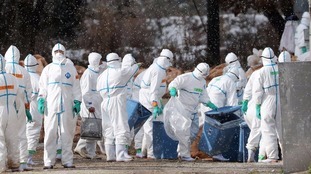 A body that advises the US Government has allowed the details of a "super strain" of the bird flu virus to be published. It had previously blocked publication arguing that it would amount to a "how-to guide" for terrorists to develop biological weapons. The virus is similar to the H5N1 "bird flu" virus, but scientists altered it so it can be transmitted aerially making it far more contagious. Virologists have described the strain as far more dangerous than anthrax. The Dutch scientists who developed the virus have argued that it must be made public so that scientists can start work on finding a way to combat it. They say the naturally-occurring H5N1 virus will inevitably mutate over time so we must be prepared.